Vermont Vacation: Da Big Cheese! It's Alive! Alive, I Tell You! Laurelwood is Dead, Long Live Laurelwood! If you're a plant nut like me, you'll see a plant in a magazine or at a nursery and it will literally stop you in your tracks. In extreme cases, it will start talking to you as well. "You can't live without me. I'm meant to be with you. Take me home." 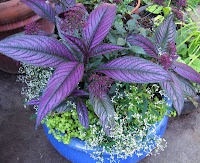 This was the situation a few years ago when I first saw Persian Shield in an article about a rooftop garden in Boston. Its eye-popping, iridescent, long purple leaves with blue-ish lilac veins and stems had me from the get-go, but in the picture it was paired with a lime green-leafed underplanting. The effect was psychedelic, and I swore I'd find it and make my own mind-altering planting. The next year there were none to be found anywhere, and the year after that I found one straggly leftover that promptly died as soon as I got it home. Then this year I hit the jackpot, finding some vibrant (and healthy) plants just a few blocks from home at Garden Fever. I picked up some companions for the three I grabbed, came home to put them in a large blue pottery planter and...voila!...the pot of my dreams! Details: Persian Shield (strobilanthus); in the center is trachelium caeruleum "Deep Violet;" the white-flowered plant is Euphorbia "Diamond Frost;" the yellow-green underplanting is Golden Japanese Sedum (sedum makinoi "Ogon"). Garden Fever, 3433 NE 24th Ave. Phone 503-287-3200. WARNING TO NON-MEAT-EATERS OF ALL STRIPES! This is going to be a graphic description of the preparation, cooking and consumption of a major body part of a young animal, so avert your eyes. That said, getta load of this! It's about five pounds of bone-in lamb leg marinated and grilled to medium-rare perfection by my in-house smoke-meister and member of the Grand Order of Charcoal, Dave. This hunk of meaty goodness started out as a rock-hard frozen lump, part of a lamb share program I belong to with three other families. Every six weeks or so we split a quarter of a lamb, which means our freezer fills up with enough for a year's worth of steaks, chops, roasts, shanks and ground bits, all just waiting for the right bolt of inspiration (or desperation) to strike. Last night we'd invited my brother and his ladylove, along with friends J&K, to come over for an evening in the backyard under the stars. After two days in the fridge thawing and about four hours before dinner, I took the leg out and adapted a simple olive oil, thyme and garlic marinade that Bobby Flay recommended for chops. Dumping all the ingredients and the leg into a giant zip-lock freezer bag, I set it on the counter to commingle, turning it once or twice. When the fire was ready, I handed it over to Dave, who first seared it over a bed of hot coals then split the coals on either side of the grill and set the leg in the center of the grill for about two hours of indirect cooking. Every twenty minutes or so, he'd add four or five new coals to each side and refill his beer glass (a vital step in any grilling process). As Mr. Leg cooked away, we served our guests mojitos from a pitcher we'd prepared just before they arrived. To make the evening even more special, and to give us something to toast, it was announced that my little bro and Miss w had become engaged on their backpacking trip the night before. Mazeltov! Then, just as the lambie was pulled off the grill and the gentlemen present gathered over it to discuss the best approach to carving, I whipped out the salad and frikeh (a scorched, green wheat) risotto and we all sat down and toasted the happy couple once again. Topping it all off was a cobbler made with rare and luscious Chester blackberries from Ayers Creek, consumed around a fire in the fire pit with much sighing and, eventually, yawning. It was the perfect end to an evening of celebration with fabulous food, wine and much laughter. Details: Download recipes for the mojitos, the lamb and the cobbler. Anthony Boutard, the bard of Ayers Creek, has graciously put me on his mailing list, and I have to say that it's an honor and a privilege to read his reflections on life at his farm in Gaston. I'm trying to encourage him to post these to a blog, so we'll see if he jumps into that particular pool. 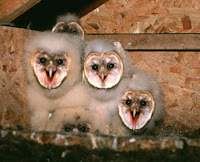 "Barn owl school started this week. You know the semester has started when you enter the barn and the ground is littered with dead mice and voles. We entered the barn early one overcast morning this week and disrupted class. The adults skedaddled into the box, leaving three of the immature birds fluttering around the barn in a state of panic. The fourth was calm and just watched us. The young birds have their immature plumage. It is similar to the parents', but distinctly darker, especially on the back. They are proportionately taller and prettier, except when they open their beaks and utter their plaintive wail. They scream all night, and the nocturnal cacophony won't cease until October. "The parents apparently teach them to hunt by bringing in living rodents and dropping them on the ground. Owls only hunt living prey, so if the unfortunate rodent suffers cardiac arrest on the way to the barn, it is dropped and ignored. It may be that the owls' eyes can only pick up moving prey in their dark night life. When hunting over open areas, their call is a metallic, nondirectional clicking sound that increases in frequency. We suspect it is used to confuse and flush their prey, so the owl can detect rodent's movement. "Barn owls have a lifespan of about 30 years, yet, according to owl experts, typically live on average only three years or so. A few years ago, we found the feathers of a barn owl scattered as though it had been killed by an accipiter, probably a goshawk. The high attrition is probably due to natural causes, as we have never seen one killed on the road. Although they tend to be a bit high-strung, there is a pair that generally nests in the siren tower of the St. Paul Fire Department. When the siren goes off it is painful to hear, yet those owls return each year. No end to wonderment." Is that blog-worthy or what? If you have words of encouragement that I can pass on, leave a comment by clicking on the "comments" button just below this post and I'll get it to him. In the meantime, you can catch Anthony and Carol live and in person at their booth at the Hillsdale Farmers Market on Sundays from 10 am till 2 pm. Write on! When I first called Peter Dixon to arrange an interview with him, he mentioned that he was due to put on an annual dinner for his village of Westminster West and invited me to come. Not being a stupid person, I accepted. Dave and I drove down, stopping in to visit David Major of Vermont Shepherd on the way. 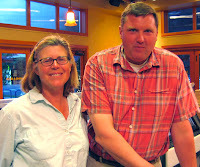 David and his first wife, Cindy, started making some of Vermont's first artisan cheese on their property in 1990, and trained several of the state's most well-known cheesemakers at their Dairy Sheep Education Center. 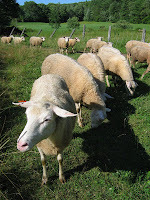 The cheese that they make, the eponymous Vermont Shepherd, is an aged, raw milk sheep cheese that is only available seasonally and has been lauded as one of the finest of its kind in the country. The afternoon we arrived, David and his second wife, Yesenia Ielpi, were heading out to bring in the sheep for the evening's milking with their two border collies. They milk the sheep twice a day and make cheese every two days during the spring and summer, then age the cheeses in the hand-dug cave on the property for four to eight months. Their supply usually runs out about the time they start all over in the spring, but it's available on their website and at outlets around the country. Leaving Vermont Shepherd (sadly, in the middle of milking), we drove the mile or so to the tiny village of Westminster West on the outskirts of the town of Westminster. According to Peter, these little villages got started when a group of townspeople would leave to start a new church and settle nearby. 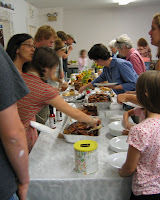 The dinner was being held in the Congregational Church in the village, and we found Peter and some helpers out behind the parish barbecuing chicken and vegetables over a couple of large grills. It being a warm evening, the village children played among the headstones of their former neighbors and relatives in the cemetery across the road. It was a wonderful demonstration of the continuity that exists in these little communities, and that same spirit was evident during the gathering over dinner. Attended by local residents and their families, as well as summer people and even a recently elected legislator who lives nearby, it was a time to catch up on news, lobby for favorite causes and enjoy the harvest of midsummer together. 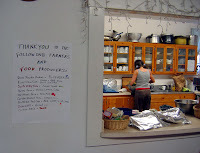 We felt privileged to be invited and welcomed into their midst, and got to chat over dinner and cleaning up the dishes afterwards. And now we have memories of that warm and perfect evening with Peter and his wife, Jake and Dahlia, Peter and Caitlin and the other wonderful people of Westminster West. Read the rest of the posts in this series: Da Big Cheese!, Burlington and Environs, Twig on a Branch, My First Time and Muddling Through Middlebury. On my way to visit Michael at Twig, I drove through the town of Middlebury and, completely charmed by its quintessential New England village main street, made a note to stop on the way back and check it out. Unfortunately, it was pouring rain on the way back, I was tired and hungry and almost didn't stop. But I thought, "This is going to make a good post for the blog." So I parked and pulled my rain jacket and hood tight around me and ventured onto the street. With a Congregational Church at the the top of the street, Middlebury is populated with local shops sporting all kinds of hockey t-shirts and tchotchkes (Middlebury College's women's hockey team has won three straight NCAA titles, and their men's team isn't too shabby, either), as well as restaurants, bookshops and a state arts and crafts store. 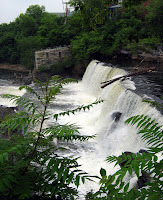 Running through the middle is Otter Creek with it's spectacular falls, visible from several viewing platforms scattered along its banks. But, as mentioned above, I was hungry and the rain was determined to find its way down my neck, so I started looking for someplace to get out of the weather. Walking back down the main street I peered down an alley and saw what looked like a restaurant hidden along the creekside and went to investigate. As I climbed the wooden stairs up to the doorway, there was a little sign that said Tully and Marie's, so I walked in and was greeted by what at first appeared to be an art-deco oceanliner that had gone aground on the banks of the creek just before it plunged over the falls. 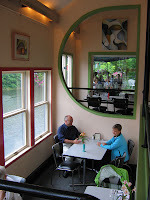 They asked if I wanted to sit outside on their leafy covered deck, but I was more in the mood for warmth and comfort, so I was seated at a table for two on the lower level overlooking the creek. Ordering a cup of what turned out to be an excellent cream of mushroom soup along with crusty and crabby crab cakes with salad, I sat and watched the rain pelt down as I congratulated myself on finding this gem. Needless to say, on leaving I was in a much better frame of mind to get in the car and drive through the rain back to Burlington. Details: Tully and Marie's, 7 Bakery Lane, Middlebury, VT. Phone 802-388-4182. Read the rest of the posts in this series: Da Big Cheese!, Burlington and Environs, Twig on a Branch, My First Time and Cheese and Community. I could have included this one in my post on Burlington, but since it was my very first experience I thought you'd want all the juicy details. I've been reading for years about driving up the coast of New England (funny how it's always driving up, not down, isn't it?) and stopping in one little town or another at the local lobster shack. It's always a game of one-upmanship about who has the best this or the freshest that, and the stick the writers use to measure one against the other is almost invariably the quality of the lobster roll. Needless to say I've wanted to have one of these for years and have never had the opportunity. So when the in-laws suggested running to nearby Essex Junction for some lobster roll action, I was all, "Are we there yet?" even though I'd had lunch earlier. 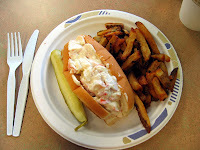 Lobster rolls are pretty simple concoctions, basically a white bread roll stuffed with chopped lobster that's been dressed with mayonnaise. Some seem to have more dressing or less, but that's pretty much as complicated as a good roll should get. Ray's Seafood Market goes along with this formula in its approach to lobster rolls and just about everything else as well. 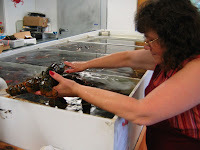 You walk in, go over to the cash register next to the two cases full of very fresh-looking seafood (including four kinds of clams and four lobster tanks), order your food, then go get a booth at the other end of the place. Most people seem to order take-out, probably because Ray's doesn't serve alcohol and their interior designer probably died sometime after WWII, having achieved his design apotheosis with the icy blue walls and diner layout of Ray's. When they call your number and you go up to get your food, the magic of Ray's kicks in. One bite of the lobster roll and your mouth is filled with the cool sumptuousness of the chunks of lobster in their mayonnaisey blanket. Served with forgettable baked fries on the side, I could have easily eaten three of these they were so good. Now I understand the obsession with finding the perfect lobster roll. And I'm ready to take up the mantle and start my own quest! Details: Ray's Seafood Market, 7 Pinecrest Dr., Essex Junction, VT. Phone 802-879-3611. Read the rest of the posts in this series: Da Big Cheese!, Burlington and Environs, Twig on a Branch, Muddling Through Middlebury and Cheese and Community. As part of my diligent information-gathering tour of the cheesemaking community in Vermont, Luan of Foster & Dobbs insisted I must, if at all possible, visit Michael and Emily Lee of Twig Farm in West Cornwall, just outside Middlebury. So I called, hoping for the best, and they were more than happy to have me stop in for a tour and a chat. They built their home and barn and graze their goats on combined acreage they bought from Emily's family and a neighbor, and designed the buildings specifically for their cheese production business. 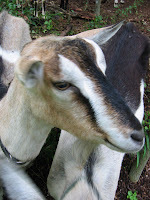 From their herd of 25 Alpine goats, they make three types of cheese, a Goat Tomme, a Square Cheese and a Soft Wheel. When I arrived, Michael ("He does everything," according to Emily) was just heading down to his cheese cellar to wash the rinds of the Soft Wheels and turn the others. 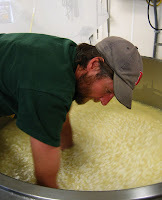 As he sat on a large blue picnic cooler and methodically washed the rinds with a salt brine solution, we talked about how he got into making cheese and what's it's like raising goats and making cheese in Vermont. A former cheese buyer for Formaggio Kitchen in the Boston area, Michael said that since he was young he had wanted to start a farm even though there was no history of farming in his family. As a young adult he worked as a pruner at an orchard, oddly enough, on Sauvie Island in Oregon, and had also done harvesting on a vegetable farm. 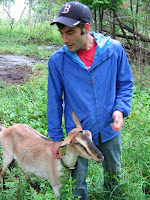 Those experiences and his own inclinations convinced him he wanted to raise animals, so he went to work for Ann and Bob Works at Peaked Mountain Farm in Townshend, Vermont, where he learned to make cheese. As for how he got started on his own cheeses, he says, "They had sheep [at Peaked Mountain] and I bought some goat milk from a farmer around here [West Cornwall], and brought it down there and mixed it with the sheep milk and made a couple of batches of the cheese that way. It worked out fine and I said, well, hey, I can make a cheese like that. I can do it consistently and well and have a salable product without a lot of loss. It makes it lot easier to get established." As for the dual duty of having animals and making cheese, something many cheesemakers avoid by buying their milk from area farmers, Michaels says, "The only way I'm going to know if I've got the milk quality that I want is to have my own animals." He does supplement his herd's milk with milk from a neighboring farmer, but knows how the farmer treats his animals and what he feeds them. And it's what they eat that makes all the difference at the end of the day. In the Soft Wheel "the variables are much more in play affecting what you can taste of the milk. With the Tomme there are variables but you can almost always see through them to see what the milk is all about. And that can make for a cheese that's sublime or a cheese that's boring. I like it from the summer but I love it from the fall. That's my favorite cheese from the tomme, starting about late summer, end of August until [the goats] come off pasture. You can taste the warmth of a September afternoon." And isn't that what artisan cheese is all about? Read the rest of the posts in this series: Da Big Cheese!, Burlington and Environs, My First Time, Muddling Through Middlebury and Cheese and Community. 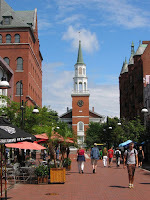 We spent the majority of our week in Burlington, the biggest city in Vermont with a population of 40,000, a lovely place on the banks of Lake Champlain in the upper northwestern third of the state at the foot of the Green Mountains. It's a university town, home of the fighting Catamounts (defined by Merriam Webster as "any of various wild cats"), which accounts for the young folk wandering the balmy summer streets around midnight. One of the hot spots downtown is American Flatbread, just off City Hall Park. Basically a pizza parlor and pub, they're dedicated to local, natural ingredients for the flatbread pizzas they make in the wood-fired oven that sits front and center in the dining room. Comparable to our temples of woodfire like Ken's or Nostrana, with Vermont microbrews featured prominently on the beverage menu, this is a place I could get comfortable going to. A favorite place and one I always return to when we visit the rels is the Bennington Potters store, featuring made-in-Vermont hand-thrown stoneware pottery. Besides having a great sale and seconds section, this store is chock full of gift items and knick-knacks alongside their traditional splatterware and newer organics collection. 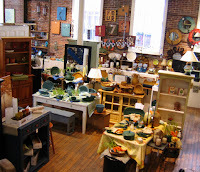 It's got the feel of an upscale country store and I just can't resist stopping in and picking up a new piece of pottery whenever we go east. 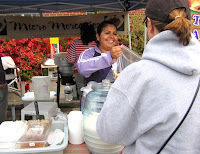 Like here, farmers markets are a big thing in Vermont with markets happening all over the city several days a week. The difference seems to be that they're not the foodie extravaganzas you find at certain markets here, but more the old-fashioned community market experience, with farmers selling fresh produce, craftspeople selling their wares with a few food vendors sprinkled into the mix. The thing I was surprised at was the variety of produce they had for such a northern climate, with peppers, fennel, beets, corn and fabulous greens. 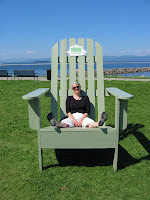 And no tour of Burlington proper would be complete without mentioning their Waterfront Park, a gorgeous stretch of prime real estate downtown along Lake Champlain that was claimed for the people of Burlington and features a 900-foot boardwalk with a portion of the 7.5 mile bike path running through it. There's a marina with access to ferries that take passengers across the lake, the ECHO Lake Aquarium and Science Center and a multitude of festivals going on all summer. Then there's the beer. Vermont is all aboard the microbrew bus and it has left the terminal at full throttle. Nearly every pub and restaurant features at least one brew on tap, and several are now bottling. From Long Trail and Magic Hat in Burlington to Otter Creek in Middlebury and The Alchemist in Waterbury (photo, left), this place is literally hopping. We sampled several, and while their IPAs don't quite grab your tonsils the way ours do, they've got some mighty fine brews happening there. They've even got a tour map of the state's breweries for visitors at the Vermont Brewers Association website for those who want to focus their vacation on liquid pursuits. 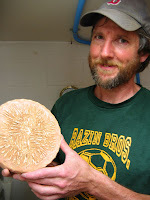 Read the rest of the posts in this series: Da Big Cheese!, Twig on a Branch, My First Time, Muddling Through Middlebury and Cheese and Community. It had been way too long since we'd been to see Dave's mother and sister in Vermont, so we decided head up to New England this summer for a little quality time with the fam. And since Culinate.com had asked me to do an article on artisan cheese for their fall issue, I made some appointments with a few artisan cheesemakers to see what they were up to. According to Jeffrey Roberts, whose Atlas of American Artisan Cheese was just published and lists 34 producers in Vermont alone, "great cheese starts from complex, vital relationships among land, climate and animals." And perhaps no one in Vermont exemplifies that better than Peter Dixon of Dairy Foods Consulting, the go-to guy in the country if you want to start making artisan cheese. Like a latter-day Johnny Appleseed, he's spreading the gospel of artisan cheese across the country and working with new and established cheesemakers to start up their businesses or expand their existing product lines. He's worked with four cheesemakers in Oregon alone, and is currently consulting with owner Angela Miller of Consider Bardwell Farm in West Pawlet, VT, on their cow and goat's milk cheeses (photo, upper left; notice the date on the house: 1819!). The day we talked he was cutting curds and making wheels of their Manchester cheese (photo, upper right). He says, "This is a wonderful kind of business to have. It's easy on the land because you're grazing and the animals are eating forage. You can get by with less grain because when you make cheese you don't need to have the cows or goats produce as much milk as when you're selling your milk. And the value of the milk is high because you're making it into cheese. It lends itself to going back to the old-fashioned way of dairy farming." 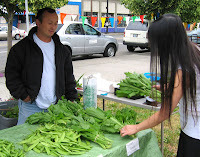 He also notes that the proliferation of farmers markets has "developed enough that people can jump into this type of business and become successful. Just look at Jasper Hill. Three years ago there was no Jasper Hill. Now there's 70,000 pounds more cheese mostly in the northeastern seaboard market. There have been ten new ones starting up to contribute another 100,000 to 200,000 pounds. Some kind of market is gobbling up all this production." And to that we can only add, "Bring it on!" 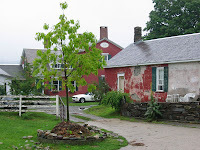 Read the rest of the posts in this series: Burlington and Environs, Twig on a Branch, My First Time, Muddling Through Middlebury and Cheese and Community. Once in awhile you go to an event and you know it's going to be good. Dinner with friends on a warm summer evening where the food and wine are unsurpassed. A concert at Mississippi Studios with an artist who's so amazing you're blown out of your seat. 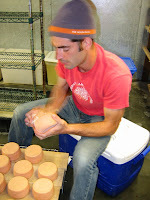 And then last week I attended a class at Foster & Dobbs featuring Anthony and Carol Boutard of Ayers Creek. Now, I've written about their jam and their stand at the Hillsdale Farmers Market, so I pretty much knew it was going to be a good night. But when they started talking about their 144 acres near Gaston and their eyes lit up when they told about the arrowhead lilies that grow there and how they changed to a drip irrigation system because the overhead sprinklers were washing out the birds' nests, I knew this wasn't going to be an ordinary evening. These two are as committed to the stewardship of their land as they are to the quality of the berries and grains they've become known for. It's evident in the way Anthony (known as the Bard of Ayers Creek) describes how the lake on their property is returning and that the least bitterns, herons and eagles are coming back. And, too, when Carol says that they stop picking the berries when the fruit loses its brilliance after the first few pickings, even though there's fruit left on the vines. We did get to taste some of that early fruit, both in the fresh and preserved state, and hear how they achieve their goal of "taking the transitory flavors of the season and concentrating them" by making the jams in small batches with only the fruit, lemon juice and organic sugar. But the real take-away from this class was the inspiration I got from two people who believe that the best change is the kind you make in your own community by doing the things you believe in. And that's worth hearing about anytime. Having lived in a place going on 30 years, you'd think I would have explored all of the great spots long ago. Great restaurants, stunning gardens, best hikes. But no. Either I'm way too boring or our area is so full of wonderful places that it's impossible to exhaust the list of new and surprising discoveries in a lifetime or two of expeditions. In the Oregonian's Homes and Gardens section a couple of weeks ago was an article on a nursery I'd never heard of called Dancing Oaks. It was started back in the late 90s when Leonard Foltz and Fred Weisensee attended a Hardy Plant Society lecture by plantsmen Wayne Winterrowd and Joe Eck. It led them to move to Fred's boyhood farm south of Monmouth to establish an extensive nursery with jaw-droppingly beautiful demonstration gardens that is a must-see destination for any gardener. And unlike many nurseries with display gardens, it has year-round interest so you can return season after season and see a completely different garden. And their selection of plants rivals any I've seen in the region, with rare and unusual varieties filling their greenhouses and prices that are very reasonable, especially given the unusual varieties found there. This would make an ideal day trip with a pal or visiting friends, and you get to drive through some of the gorgeous farmland of the central Willamette Valley, with hayfields, dairies and little towns along the way. Just remember to have plenty of extra room in the car to stash the plants you're going to be bringing home. Details: Dancing Oaks Nursery, 17900 Priem Road, Monmouth. Phone 503-838-6058. 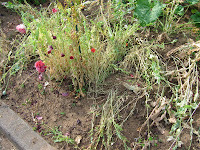 I got back from my foray to Dancing Oaks Nursery to find an e-mail from our neighbor SEH that said someone had driven by in the middle of the night and pulled up and destroyed the poppy patch in their garden. No one saw the perpetrators or reported hearing anything out of the ordinary, though Gabe, their alert Australian Shepherd, had gone ballistic around 11:30 that night. 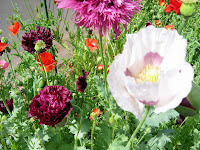 In her wisdom the next day, however, SEH chose to do some retail therapy and ordered a slew of new poppies that she'll plant inside the fence this time. And we'll all take turns at guard duty till the seeds get harvested! After our recent heat wave, I was feeling confined and sticky from staying inside too many days in a row. Then I noticed that our friend Kat Cogswell and her group, Django's Cadillac, were playing a concert in the park in NW Portland. So I hit the deli at New Seasons, ran by to pick up the mom from her pad, and headed over to Wallace Park. We found a place in the shade on a grassy slope near the stage, hauled out the appies and settled in for lovely evening of food, music and communing with the Nob Hill 'hoodies. There was a medium-sized crowd with plenty of room to spread out without getting in a territorial dispute with your fellow concert-goers, and lots of concessions if you wanted to buy your food, including a stand from Pizza Schmizza where you could have a whole pizza delivered to your blanket! 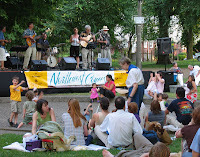 The concert started promptly at 6:30 and Kat rocked the park with her incredible voice on classic jazz standards till 8, then the crowd dispersed to put the kiddies to bed and take the dog for a walk. What a perfect evening! As mentioned below, our beloved Laurelwood Pub in Hollywood closed last week in order that it might rise from its ashes and be reborn as Laurelwood Pizza. We first went there when it was the Old World Pub with some amazingly stunning beers put out by a brewer who looked to be about 14 years old. This wunderkind brewmaster, Christian Ettinger, then proceeded to win nearly every award, both local and national, given in the microbrewing industry and put Laurelwood on the national brewing map. He left about a year ago to open his own much-anticipated Hopworks Urban Brewery (HUB) on SE 30th and Powell, and Laurelwood has a new brewer, Chad Kennedy, who is developing his own brews to add to the lineup of house beers. 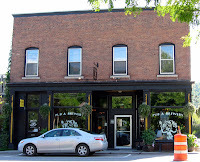 With the success of the original pub and the beers Christian developed, they needed a much larger brewing facility to accomodate not only their own pubs but also their commercial customers in restaurants around the city and a desire to start bottling their beers. So now they've opened a little further up the street in a huge new brewing facility that includes a restaurant, not one but two play areas for tykes and a blessedly (so far) kid-free bar area for those who want to concentrate on their hops. The menu remains unchanged, so you can still get their terrific fish and chips, and the taps have expanded to offer plentiful seasonals along with their usual brews. The one thing lacking is a cask tap, but we'll hope to see at least one in place very soon. An odd new development we noticed on our last visit is a glass-rinsing contraption at each tap. Since they store their glasses upside down at the bar and go through them like crazy, what's the point of this? The water from the rinsing puddles in the bottom of the glass, so you're getting water in your beer. So we're going to be requesting our glasses to be dry when they're filled, thanks very much. Regardless, the new place has been slammed with people since they opened last Friday (how did people find out? ), and it's kept the low-key atmo that made the original location a nice place to hang. There's plenty of parking to be had in the large lot behind the building, so head over, check it out and let us know what you think! Details: Laurelwood Pub and Brewery, 5115 NE Sandy Blvd. Phone 503-282-0622. There are so many things that are gone now that I wish I'd seen before they left us. The hanging gardens of Babylon, the dodo bird, Napoleon and Josephine in their heydey (did he really walk around with his hand in his jacket like that?). 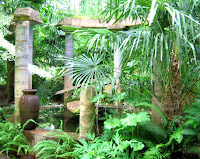 And, in what may be that last chance the public has to walk through the amazing world-class botanical garden known as Heronswood before the Burpee Company sells it off for development, the Garden Conservancy is hosting a tour of gardens on Bainbridge Island and Kingston that will include this one-of-a-kind heritage level garden. It's happening on July 21 and the cost for touring the garden is only $5, well worth the price of gas and the hour-and-a-half drive to get up there. 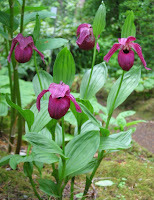 A group I've blogged about before, the Pacific NW Horticultural Conservancy, was originally formed to try to preserve this treasure from development, but negotiations with the Burpee Company broke down several weeks ago over Burpee president John Ball's refusal to allow the property to be appraised. Members of the PNHC board will be there touring the garden and will be wearing their "PNHC/Preserve Heronswood" buttons, so if you go, look for them and give them a pat on the back and wish them good luck in their mission. 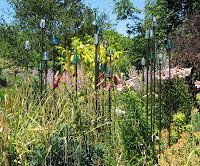 Details: Tour of Heronswood Garden sponsored by The Garden Conservancy. At Heronswood, 7350 N.E. 288th Street, Kingston, Washington. Phone 1-888-842-2442 for information. When berry season comes around, I'm one of those people you see at the farmers' market hauling flats of berries to the car. Not that it's a bad thing, but when you consider I'm also carrying several bags of produce along, too, it gets to be a bit precarious. But I just can't seem to resist the siren song of those luscious baskets of Hood strawberries, red raspberries, marionberries, blueberries and blackberries. There's nothing like a great fruit crisp made from equal parts raspberries, blueberries and blackberries, or in the middle of January pulling bags out of the freezer and making smoothies, bringing back the warmth and sunshine of those fleeting summer months. Lately we've been incorporating the bounty of our region's berries into our own infused vodkas, mashing up the fruit in a bowl, maybe throwing an herb or two in with a bottle of vodka and letting it sit for a week or so in the fridge. My friend Michel came up with a recipe for raspberry-lavender lemon drops using her own infused vodka, and we just made some with the first of the season's raspberries and inexpensive Monopolowa vodka. 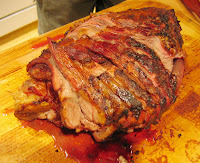 You can download the recipe and try it yourself at next weekend's barbecues. From the reaction we got serving the first batch to the neighbors, I guarantee you'll be the most popular person at the party. Sometimes you're driving along and a piece of street art just grabs you by the lapels. That happened the other day when I was heading to my exercise class and saw that someone had scribbled "Clapton is God" on a wall. Now, I'm old enough to remember when Clapton was actually called God because of his virtuosic guitar work, and it made me wonder who had just discovered him and decided to anoint him anew. Then I was meandering down SE 12th Avenue just north of Burnside and saw this piece of commentary and it made me laugh out loud. When we were looking for our first house in Sellwood, our friends who lived on the west side of the river would say, "The crime rate goes up the further east you go." Pretty funny how things have changed! Traditions are all a matter of perspective. They can be constraining, like having tuna casserole for dinner every Friday night of your life, or they can be affirming of the ongoing nature of life and its cycles. One recent tradition we've enjoyed is the yearly series of rosé dinners that Monique and Kevin host each summer at Castagna Restaurant on Hawthorne. Like last year, this summer they're doing a series of four casual, family-style regional dinners arranged around our favorite summer wines. Each dinner includes three courses and two glasses of rose for $45, a steal at any price. And from the dinners we went to last year, each course is packed with great food, and those two glasses seem to be refilled at least once. • July 18 Loire Valley: Cider-cured pork loin cooked in hay with André Neveu Sancerre Pinot noir 2006 and Lucien Crochet Sancerre Pinot noir 2006. • Aug. 1 Provence: Grand Aioli dinner of garlic-centric dishes with Commanderie de Peyrassol 2006 and Chateau Miraval 2006. • Aug. 15 Bandol: Bouillabaisse with Chateau Pradeaux 2006 and Domaine de Terrebrune 2006. • Aug. 29 Cassis: Roast Bronzini with Clos Sainte Magdelaine 2006 and Domaine du Bagnol 2006. Make your reservations now to guarantee a seat. If you've been looking for a reason to move from the café side of the wall to the restaurant, this is a fantastic excuse to do it! Details: Castagna Restaurant, 1752 SE Hawthorne Blvd. at the corner of 18th. Phone 503-231-7373 for reservations. Temperatures have been hot and are heating up, and so is the action in the garden, both here and next door (left). The corn is getting all tassled, the sunflowers are taller than most of the people and it's time to start pulling up the lettuce and putting in the midsummer vegetables like kale, chard, carrots, beets, broccoli and radishes for harvesting in September and October. Most impressive at this point are the poppies that SEH planted from seeds she'd gathered, some of which are as big and full as peonies in splashy burgundy, pink and purple. The trick is going to be labeling the stalks so that when the pods are harvested and dried, their seeds can be gathered and kept separate for future reference. I'm volunteering to help, of course, not only because it appeals to the OCD side of my personality, but also in the hope that we can get a few of these beauties for our yard next year. Speaking of our yard, our raised bed has been joined by a sibling on the slope, and it has been planted with pepper starts (ancho and jalapeno) and sown with flageolet beans. The tomatoes we planted in late April are threatening to pull themselves out of the ground and terrorize the neighborhood ala Godzilla. We're hoping they stick around for awhile, though, since they're starting to set fruit and we'd really like an heirloom tomato salad or two before they leave us to take over the world. And, as noted earlier, you can download plans for Dave's 20-Year Raised Bed if you'd like to build your own. Though there most likely won't be any mud, there are going to be crowds of feet beating their way down to the 6th Annual Mississippi Avenue Street Fair on July 14 (Sat.). A free event to benefit Boise-Eliot Elementary School, it's featuring a wide diversity of music and dance performances, children’s games, snacks galore from Mississippi Avenue restaurants, a fashion show, local arts and crafts and a giant community yard sale. Taco bar extraordinaire ¿Por Que No? Taqueria will have a Margarita Bar out on the street to quench your thirst, and the music stage will be rocking with the likes of Samba Sol, 5 Fingers of Funk, Samba Feat, Funk Plastic and White Rhino. And if last year is any indication, you won't be able to keep yourself from having a good time. See you there! Details: Mississippi Avenue Street Fair. July 14, 11 am-7 pm; Free. Mississippi Ave. between N. Fremont and Prescott. When the days get hot and the dining room moves outdoors, I develop a thirst for something dry and pink. Fortunately, this is the time of year when Oregon winemaker John Paul, he of Cameron Winery fame, releases his subversively titled Vino Pinko with it's portrait of Che Guevara on the label. And if you're still associating a rosé with those awful "white zinfandels" or the pink stuff in the funny bottle from Mateus that you drank in days of yore, you've got to step into the 21st century, man. These wines are red-hot for summer sipping and great examples are available from France, Spain and Italy as well as right here. Served ice-cold, their bracing acidity sets off almost any appetizer or main course from seafood to pasta to salmon. Now, whether Che himself would appreciate this wine, we can't say, but we know he'd love the reaction it gets at gatherings. Got a barbecue coming up with some Republican/conservative co-workers or relatives? This is the perfect wine to bring to the event. And if you want some, get it soon since there's a limited volume produced and it sells out quickly. Viva la revolucion! Details: 2007 Cameroni Vino Pinko, $14.95. 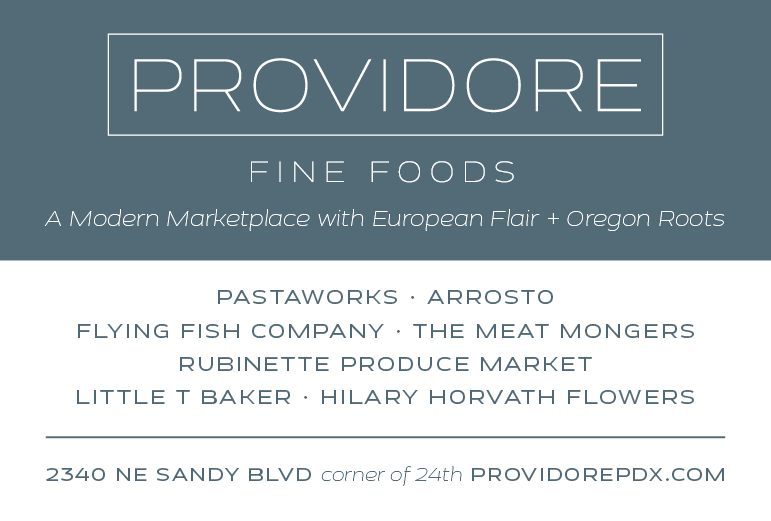 Available from Vino in Sellwood, phone 503-235-8545 or from your favorite neighborhood retailer. Sometimes you take a class or start a project and you never know where it's going to lead. Like this blog, for instance. Who knew that it would be as much fun to write as it is more than 200 posts and a year and a half later? That its readership would be doubling every few months, or that such great people would take valuable time out of their day to read it? Then last week I got an e-mail from the editor, Martha Holmberg, saying, "I'm realizing now that you're our regular 'correspondent' for this! I thought at first that I'd have several volunteers, but you're the one who consistently delivers good stuff, along with our staffers, of course." So now it's official, and you can look for my column to appear on a fairly regular basis in FoodDay between now and Christmas. Who'd have thought? 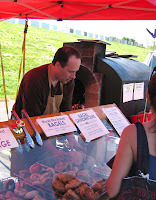 Photos, from top: Micro Mercantes at the Hollywood Farmers' Market; Blooming Gardens at Lents International Farmers' Market; Woodfire Baked Brick Oven Bagels at Hillsdale Farmers' Market. I don't do well with change. The haircutter I've used for 15 years leaves town and I'm a mess for months. Good friends move to Santa Barbara and I pout and fuss, especially since it was only for a prestigious and high-paying job, for goodness sakes. I mean, didn't they consider how that would affect me? And now, heaven help us, our beloved Laurelwood Pub and Brewery in Hollywood is closing after today. But this change has an up side. 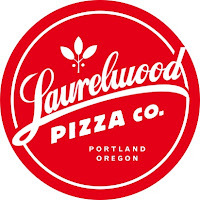 It's set to reopen in a couple of weeks as Laurelwood Pizza Company and will be featuring antibiotic- and hormone-free meats and organic tomatoes in their pies, as well as their usual fantastic beers. And this weekend, just up Sandy at 51st, they're opening the latest and greatest in what is becoming a burgeoning brewpub empire. I haven't visited this location yet, but it's apparently going to more than double their seating capacity and feature not just one but two play areas for kids. 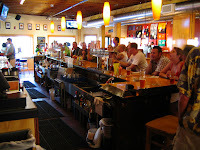 At times the old location felt like a day care center with so many tykes running around screaming, but owner Mike deKalb says the new place has more separation between the bar and the kid-friendly areas, so we can hope for a bit of peace and quiet while we sip. So look for reports from your intrepid reporter soon on both these locations! Details: Laurelwood Pizza Co., 1728 NE 40th Ave. Phone 503-282-0622.